Whether you’re completely new to working with contact relationship management databases, or a seasoned professional who has worked with multiple CRMs in the past, sometimes you need a little helping hand. It never hurts to have a reliable resource on-hand to guide you through best practices when setting up your CRM. We, of course, want you to be successful while migrating all your data into Nimble. Additionally, we want you to be able to set up your CRM in such a way that it does more for you, than you have to do for it. 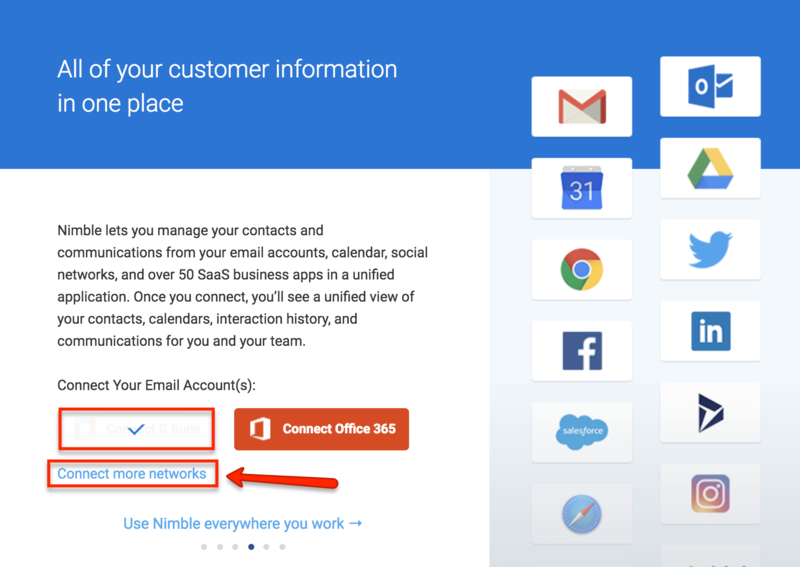 In this post, I will guide you through a step-by-step process of setting up your Nimble account by importing your contacts and connecting all your emails, calendars, and other applications. After logging into your Nimble account for the very first time, you will be guided through a brief onboarding sequence. On the third slide of the sequence, we will invite you to connect your email and social accounts. In order to get the most out of Nimble, we highly suggest you do so now! The following slide will ask you if you are a G Suite or Office 365 user. If you are using a combination of the two, it’s your lucky day! You can absolutely connect both your Outlook and Gmail email accounts, as well as your Google Calendars and Outlook calendars. After connecting your first email account, you will have the option to connect additional networks. If you choose to select this option, a new tab will open up and you will be taken into our “Networks & Imports” section. If you are connecting multiple Gmail accounts, you can later pick and choose from which one you’d like to email your prospects and customers. You can connect any email client to Nimble as long it is an IMAP account. To learn more about how to do so, check out our support article here. In order to send messages from Nimble and sync your message history to individual contact records, you will have to connect your Office 365 account (first option in the image above). 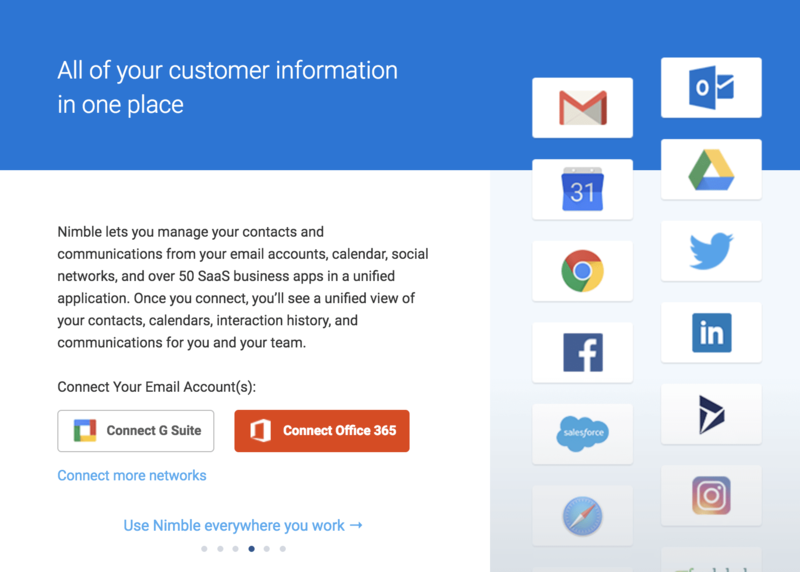 Nimble also allows you to send group messages and import your Office 365 contacts. If you’d like to be able to sync history, send group messages, and also import your contacts, you will also have to connect your Office 365 via the REST API (second image above). Here’s more information on how to do so. Connecting your calendars to Nimble will ensure that your calendar events are synced with individual contact records. You will also be able to see what is on your calendar each day immediately after logging into Nimble. We have a full two-way sync with multiple Google Calendars so you can connect all your important events with Nimble in seconds. If you need guidance or have any questions, refer to this post. If you are using an Office 365 Calendar in addition to using Google Calendar, or are only using Office 365 Calendar, you can easily connect it as well. For more information about the integration, read through our article here. In addition to connecting your email accounts to Nimble, you can also connect your social accounts such as Twitter, Facebook, Facebook Business Page, Instagram, and more. Nimble offers a direct integration with Twitter. After you connect your Twitter account, your tweets, comments, mentions, likes, and direct messages will be displayed in your Signals tab; as well as synced with related contact records. What to keep in mind: Once you’ve connected your Twitter account, you’ll see the option to import your contacts. Nimble also gives you the ability to only import people you follow or specific Twitter lists. We strongly encourage you to only import important Twitter contacts into Nimble in order to keep your database as clean as possible. Once you decide which contacts you’d like to import from Twitter, make sure you attach appropriate tags to them so your contacts are well-organized. You will need to connect your personal Facebook account in order to be able to connect your Facebook business page. In 2015, Facebook shut down their API to all third-party applications. Don’t worry – you can still use Nimble on Facebook via our browser extension (which we’ll get into below). To find out more about the current integration, see this post. Unfortunately, LinkedIn does not allow Nimble to sync messages over their API; luckily, our Nimble Smart Contacts App helps you stay in touch while messaging over LinkedIn (again, we will explain in greater detail later in this article). 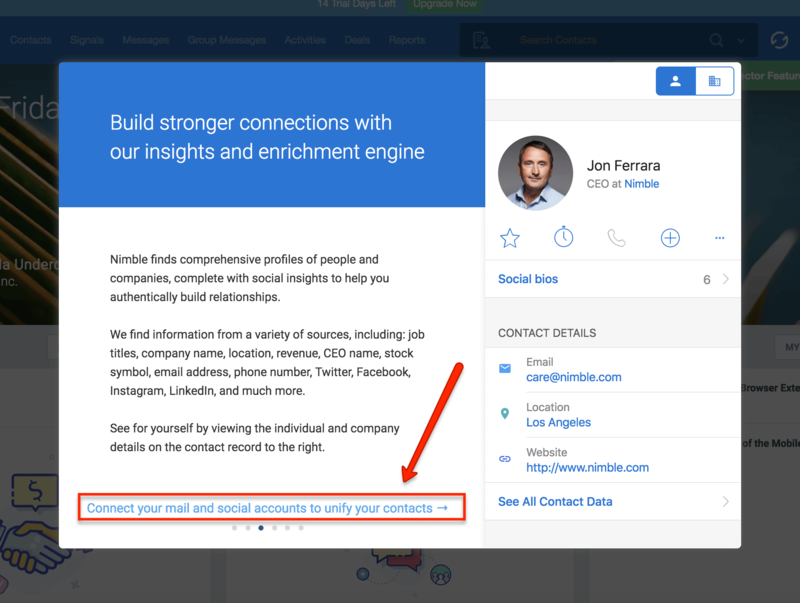 You can still import your LinkedIn contacts into Nimble (a step-by-step guide on how to do so can be found here), but before you do so, please scrub the file first to see if everybody who you’ve connected with over the years absolutely has to be in your CRM database. It will require some time and manual work, but it will contribute to a successful migration and future use of your new CRM. Nimble also allows you to connect your Foursquare, Instagram, and Google+ accounts. If you have any questions about integrating with social networks, please reach out to care@nimble.com. You and your team probably use multiple applications to run your day-to-day activities. Our integration with PieSync allows you to seamlessly integrate them with Nimble. For example, let’s say you’re using MailChimp to manage your email lists. Set up the Nimble – MailChimp – PieSync integration; every time you add or update a contact in Nimble, it will automatically be synced with Mailchimp, and vice versa – eliminating import/export! For detailed information about using PieSync and Nimble, please visit our support article. If you are downloading your contacts from a third-party application, the file will be downloaded in a csv (comma-separated values) format. If you are sure that your contact list is “clean’ enough, you can proceed to “Start Wizard” and have Nimble guide you through the field mapping process. Additionally, Nimble allows you to save your mappings for any future imports. If you are not sure that the list you have in hand only contains the people that you absolutely have to have in your brand-new CRM system, please spend some time cleaning it up as keeping your data clean is going to pay off in the long run! Tweet: Clean up your #data before importing into your new #CRM system. The time spent on it will pay off big-time in the long run! If you’d like to import a CSV file with your Outlook contacts, here’s a detailed article on how to do so. You can either use our “Import CSV” button located at the top of our “Networks & Imports” page, or use Outlook CSV button at the bottom of the page. Additionally, you can also import contacts using the vCard option in Nimble. If you need to migrate your data into Nimble from another service, our customer success team has developed a detailed guide on how to do so. If you are using Google Drive, connect it to Nimble and start attaching files to appropriate contacts. This will ensure that you have all the information about a particular person or company in one place saving you time on searching for documents. That’s it. You are all set! If you have any questions about setting up your Nimble account and connecting your emails, calendars, and third-party applications, let us know at care@nimble.com or sign up for our daily training sessions. Michaela is a Community Manager at Nimble. She is passionate about Customer Service, everything Social Media and growing our Nimble community. She tweets as @MichaUnderdahl. Cloud vs SaaS Applications: What’s the Difference? What Questions Should You Ask When Hiring a Sales Manager?